Juan has this awesome hat that makes him look like he is exploring Latin America. He looks truly hip in this photo. 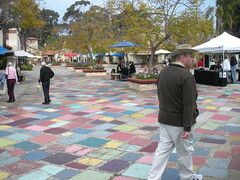 We are at the Spanish Village, art studios, at Balboa Park. �D�nde est� Rocky? �Ahora que pienso en ello, d�nde est�n mis pantalones?